When we reported that for the first time ever an electric dirt bike would compete in professional motocross, you didn’t imagine we were going to not follow up with the results, did you? 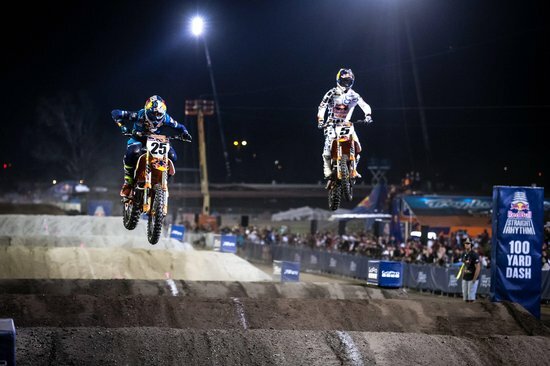 In a nut shell, the electric dirt bike beat a traditional dirt bike in the first round of the Red Bull Straight Rhythm competition, but was knocked out in the semis. Josh Hill took the electric Alta Red Shift MX to victory in a best out of three head-to-head match-up with Kyle Cunningham on a 125 cc. The win marks a first for an electric bike, and establishes a reputation for San Francisco-based Alta Motors out of the gate. Of course, if it had gone the other way, the immediate future of the electric bike would be in question. But out there in Pamona, California, Hill managed to allay the fears of electric advocates puting those doubts to rest. It’s obvious the appearance of the electric dirt bike got the attention of the crowd at the event, but Mac got himself together and made a solid run in the Lites class. Still, what we have come to understand as the loud, spark plug driven, supercharged world of motocross is without a doubt changing if the Redshift debut is any indication. But while Hill did not make it to the finals, he did go up against Troy Lee Designs Factory KTM of Mitchell Oldenberg in the semifinals. Not a bad showing for the first time out. And most certainly its a harbinger for things to come in the world of electric racing. For more visit Red Bull.